Ceyhan V, Emir M. Structural and Economic Analysis of Turkish Fishmeal and Fish Oil. 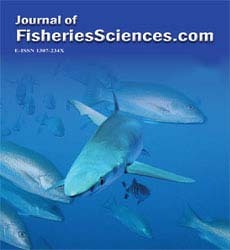 Turkish Journal of Fisheries and Aquatic Sicences 15: 841-850. BaÅçÄ±nar NS, Seyhan K, BaÅçÄ±nar N. GASTRIC EMPTYING IN THE Salvelinus fontinalis YOLK-SAC LARVAE FEED ON GRANULE COMMERCIAL FEED. Zarei I, Pourkhabbaz A, Alipour H, Khazaei SH (2013) Acute Toxicity and the effects of copper sulphate (CuSO4. 5H2O) on the behavior of the black fish (Capoeta fusca). Iranian Journal of Toxicology 6: 771-778. Seyhan K, BaÅçÄ±nar NS, BaÅçÄ±nar N. GASTRIC EMPTYING IN THE FREE SWIMMING BROOK TROUT LARVAE. Batool M, Abdullah S, Javed M (2014) Behavioral intoxication of Channa marulius and Wallago attu during acute exposure of cadmium and copper. Aquatic. ERGÖNÜL MB, ALTINDAÄ A (2011) Çinko ve BakÄ±rÄ±n Kadife BalÄ±ÄÄ± (Tinca tinca L., 1758) için Akut Toksisitesinin Belirlenmesi. KahramanmaraÅ Sütçü Ä°mam Üniversitesi DoÄa Bilimleri Dergisi 4: 19-24. Ariole CN, Ukeje C. Toxicity of Zinc to Tropical Freshwater Snail (Pila ovata). Budiyanto E, Aditya AR, Wardani AY, Budimarwanti C. Usage of Tuba (Derris eliptica) Root Extract as Environmentally-friendly Insecticide to Control the Population of Lymantria beatrix. The! Efficacy! of! Underdog! Brand! Strategy! in! Indonesia’s! Political! Marketing 53. Aldoghachi MJ, Rahman MM, Yusoff I, Sofian-Azirun M (2016) ACUTE TOXICITY AND BIOACCUMULATION OF HEAVY METALS IN RED TILAPIA FISH. JAPS, Journal of Animal and Plant Sciences 26: 507-513. SanjuásâRey M, GarcíaâSoto B, BarrosâVelázquez J, FuertesâGamundi JR, Aubourg SP (2011) Effect of a twoâstep natural organic acid treatment on microbial activity and lipid damage during blue whiting (Micromesistius poutassou) chilling. International Journal of Food Science & Technology 46: 1021-1030. Eysteinsson SÞ. Marinated and dried blue whiting (Micromesistius poutassou). GündoÄdu S, Baylan M (2016) Analyzing growth studies of four Mullidae species distributed in Mediterranean Sea and Black Sea. Pak J Zool 48: 435-446. Yildiz T, Karakulak FS (2016) An investigation of age, growth and mortality of the red mullet Mullus barbatus Linnaeus, 1758 in the western Black Sea. CAHIERS DE BIOLOGIE MARINE 57: 415-425. Barnes ME, Bergmann D, Kelley RL, Cordes RJ, Nero PA (2010) A survey of bacteria in the ovarian fluid of landlocked fall Chinook Salmon and their relationship with egg survival. North American Journal of Aquaculture 72: 314-320. Boonthai T, Khaopong W, Sangsong J, Sooksawat T, Vuthiphandchai V et al. (2014) Evaluation of the potential source of bacterial contamination during cryopreservation process of silver barb (Barbodes gonionotus) sperm. Aquaculture Research. Yahya M, Rasha MR, Eletreby S (2014) Case study on mass mortality problem of Cyprinus carpio Eggs in El-Abbassa fish hatchery in Egypt. International Journal of Research in Fisheries and Aquaculture 4: 8-13. Kaya Y, Turan H, Emin Erdem M (2008) Fatty acid and amino acid composition of raw and hot smoked sturgeon (Huso huso, L. 1758). International journal of food sciences and nutrition 59: 635-642. Boonthai T, Khaopong W, Sangsong J, Nimrat S, Vuthiphandchai V (2016) Effect of antibiotic supplementation on the quality of cryopreserved fish sperm of silver barb (Barbodes gonionotus): Sperm motility and viability, bacterial quality and fertilization. Animal reproduction science 166: 36-46. Cipriano RC (2015) Bacterial analysis of fertilized eggs of Atlantic salmon from the Penobscot, Naraguagus, and Machias rivers, Maine. Journal of aquatic animal health 27: 172-177. Erkan N, Ulusoy Å, Tosun ÅY (2011) Effect of combined application of plant extract and vacuum packaged treatment on the quality of hot smoked rainbow trout. Journal für Verbraucherschutz und Lebensmittelsicherheit 6: 419-426.